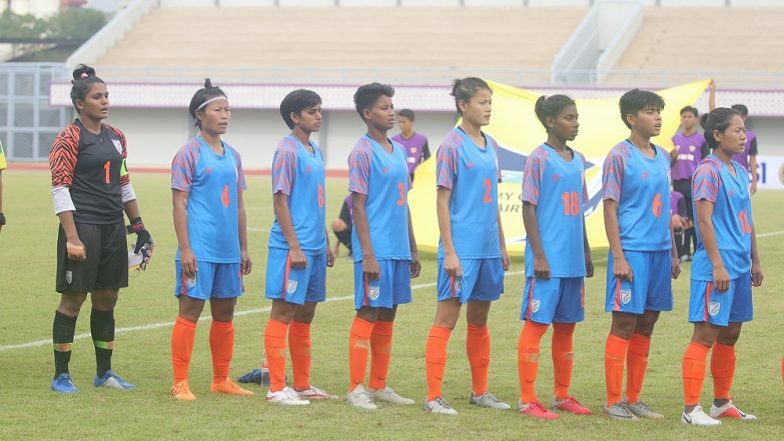 Mandalay, April 9: The Indian women's football team bowed out of the Olympic Qualifiers after being held 3-3 by hosts Myanmar at the Mandalar Thiri Stadium here on Tuesday. Despite finishing on level points with Myanmar (7 points from 3 matches) in Group A, India failed to progress to an inferior goal difference of +4, in comparison to Myanmar's +8. Sandhiya had given the Indian women an early lead in the 10th minute but a hat-trick from Win Tun for Myanmar (17th, 21th, 72th) held India as Sanju's 32nd minute strike and Ratanbala Devi's 64th minute goal couldn't help gather the visitors three points. Sanju came close to giving India the lead as early as the 2nd minute when her shot from close range, off a Dangmei Grace cross, went out for a corner. The women had to wait eight minutes more before surging into the lead. In the 10th minute, Ratanbala burst out on the right flank, and released a low cross for Sandhiya Ranganathan, who made no mistake to finish from inside the box giving India the lead. 2020 Olympic Qualifiers: Indian Women’s Football Team Take On Myanmar in Must-Win Game. The lead, however, was short-lived as Myanmar scored two goals in five minutes. First, in the 17th minute, Win Tun's header from inside the box equalised the deficit for the opponents. Four minutes later, Myanmar took the lead from the spot. Goalkeeper Linthoi Devi dived to her right to save the penalty, but Win Tun lurching around scored off the rebound to make it 2-1 for the hosts. Myanmar goalkeeper May Nwe fluffed her lines and made a howler of a clearance that fell to Ratanbala Devi, who chested it down for Sanju. Making little mistake, Sanju buried her chance in the back of the net to level proceedings in the 32nd minute as both teams headed to the interval at 2-2. In the second half, Myanmar dominated the opening minutes, and the Indian defence had to shut the opponents with some astute defending. In the 64th minute, Ratanbala Devi turned the tide for India. The midfielder cut into the box from the right flank and unfurled a curling shot which crashed into the back of the Myanmar net leaving the opponent custodian dumbfounded, giving India the lead as the scoreline read 3-2. Eight minutes later, Win Tun completed her hat-trick, finishing from close range to equalize Myanmar's deficit. India could have sealed the fate in the 76th minute when Sanju ran clear of the defensive mix, but the Myanmar custodian made a good reflex save from close range to tip her shot over the bar. A minute later, Dangmei Grace burst through but this time the custodian put her body on the line to shield the ball.